How Old Does Your Child Have to be to Enjoy Reading Aloud? 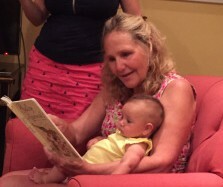 I got to read my first book to my granddaughter! And even I found it hard to believe that at a little over three months old, Eliza actually seemed to be paying attention. I didn’t have a good look at her eyes, but everyone watching said she was staring at the page and following my hand as I pointed to the pictures. I felt her concentration: her little body was still and focused as I read the words aloud. How thrilling! She can feel the magic of a book as an infant. It’s my dream fulfilled: to transmit the excitement and the joy of reading to someone waiting to receive it. And who is more receptive than an infant, who spends her days astronomically increasing her knowledge of the world. I know she will be picking up books and wanting to read by herself before I can blink my eyes. I am so happy to be part of the journey. I want to teach the world to love to read. It appears it is never too early to start. August 28, 2015 in creativity, Mind, Need-to-know, parenting.